Oh, readers! Such joy followed those words! 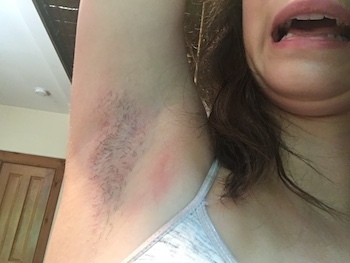 She had been growing out her armpit hair for 10 days for just this occasion. Of COURSE I would wax her armpits! Isn’t that what mothers are for? Since I’m a Sephora whore (Sephora whore-ah? ), I own a home waxing kit. Well, not a kit, really…I own wax. And ever since the Princess was a wee little sprite, she’s loved wax, dipping her fingertips into soft candles as a tot, later doing the hand-dip on Mother-Princess nights, and the best part…peeling it off. And so it began. She found the aged jar of hardened wax and attempted to unscrew it, eventually handing it over to her brawny mother, who used her superior strength to wrestle it open. “Of course not!” said I. And so I smeared the honey-colored wax on my precious girl. “Ow,” she said as the wax pulled at the hair. She did. And then, when the wax was cool, I peeled it back a bit. I did. She screamed, always one to become furious in the face of pain. “Wait till you give birth,” I murmured. I showed her the wax glob I had torn from her perfect skin, and she laughed till tears ran down her face. Several hairs had come out. Ninety-five percent had not. A few follicles were bleeding. “Let me blot the blood,” I said. “No! The tissue will get stuck.” We snorted some more at the vision of her armpit dotted with shards of Kleenex. “I think we’re done,” the Princess said. I soothingly dabbed her underarm with olive oil, since we didn’t have baby oil. Then, to show my solidarity, I smeared some wax on my arm and pulled it off (remember, my own mother dubbed me her “little gorilla baby,” as I was a hirsute infant). “Didn’t work for me, either,” I said. The Princess hobbled up to her bathroom, returning (eventually) with clean-shaven underarms. “That was fun,” I said, and she agreed, and we threw away the wax together, until the next time I’m tempted by the idea of doing I have no business attempting in the first place.